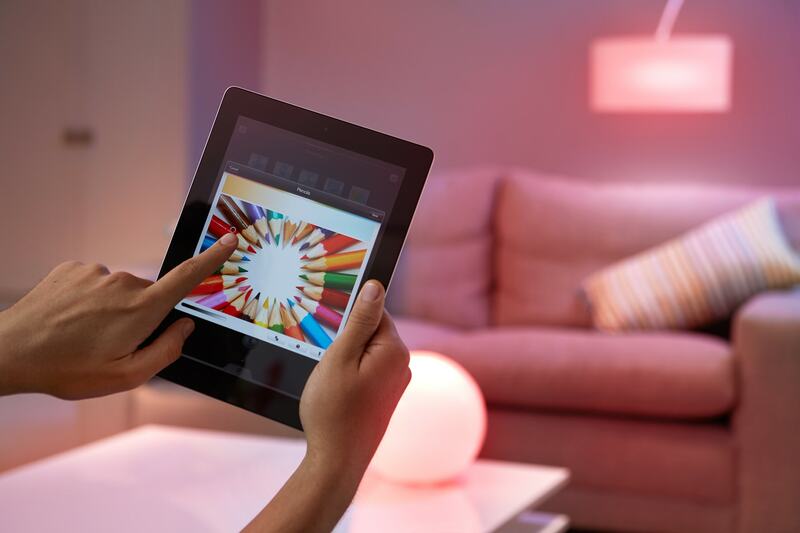 Somerset, N.J. – Continuing its tradition of developing innovative lighting products and solutions, Philips today introduced hue, the world’s first Web-enabled LED home lighting system available direct to the consumer. Offered exclusively through Apple stores beginning on October 30, the hue starter kit includes three LED bulbs that fit into any standard light fixture, a bridge that connects to existing wireless routers. Philips hue sets up in minutes and, with a quick download of the hue application, the system can be controlled from any iOS or Android device. From the app, consumers can remotely control their home lighting for added security, personalize their lighting experience with custom settings, or program timers to help manage daily schedules, all through the convenience of their smart device. In home testing done in New York, Berlin and Shanghai, consumers highlighted hue’s great light quality and programmable reminders, as well as the fact they could control their lighting from outside the home, as features they most appreciated. Moreover, consumers liked the ability to save personal light settings and recreate them at the touch of a button. hue includes 4 pre-programmed light settings based on Philips’ research around lighting’s optimal effects. These pre-programmed scenarios adjust the bulbs to the optimum shade and brightness of white light to relax, read or boost mood and energy. LEDs have changed the paradigms of flexibility in lighting as they succeed technology like fluorescent, halogen and incandescent, which offered very limited control. With LEDs, lighting can be digitized as the small footprint and semiconductor design allows them to be easily integrated into electronic circuitry. It is this seamless integration into electronic circuits which allows them to deliver unique light outputs on the command of electrical signals. This enables Philips to build smart bulbs into a system where every light bulb has a unique web address and can be integrated with software applications such as the one that comes with hue. Using the ZigBee LightLink standard, hue bulbs can communicate with each other, allowing them to have a broad signal range, despite the location of the bridge in the home. The standard also allows the system to use significantly less stand-by power than traditional Wi-Fi systems. Further, hue is based on open standards and can be easily integrated with other ZigBee-based systems, such as motion sensors and home thermostats, for additional home automation. Software updates for the bulbs are done automatically via the bridge and the bulbs themselves, making it easy and intuitive for users and essentially future-proofing the customer’s investment in hue. Building on the company’s AmbiLight experience, Philips is developing future product features, such as allowing hue to integrate with other media including sound and video. Further, the company is working on features such as geo-location services, allowing hue to sense when a user is close to home and automatically turn on the lights, or turn the off when the user has left. Philips is also researching the application of reverse indicators, enabling hue to alert that the lighting has not been turned on during a specific time period, offering numerous possibilities around senior care. Philips will make the hue interface and software development kit (SDK) available to anyone who wants to create additional functionality or applications that interact with the system. The applications will then be tested by the Philips connected lighting team to ensure they are viable. hue starter kits will retail for $199 and are available at Apple stores nationwide on October 30. Additional bulbs will be available at $59. 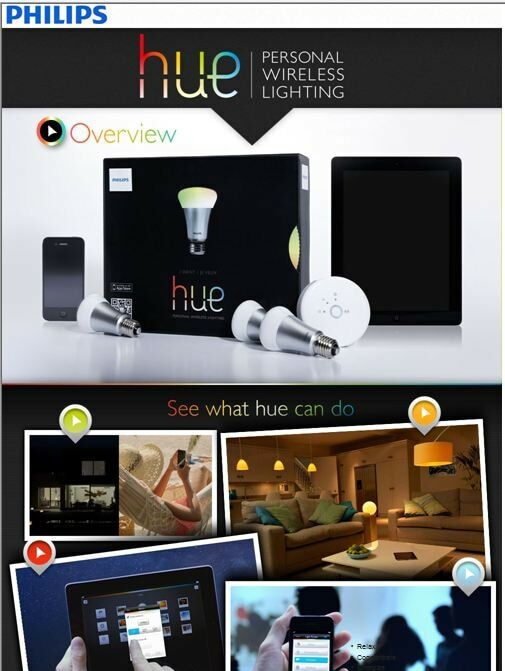 For more information about hue and its capabilities, please visit www.meethue.com. Download a rich media infographic showing what hue can do. Download high-resolution video and photos.